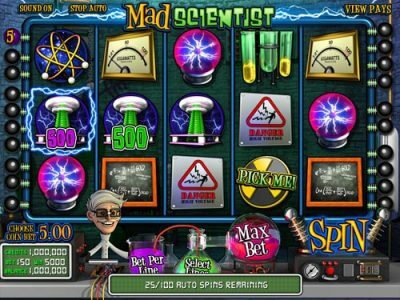 This can only be described as another spellbinding Bitcoin slot by Betsoft. This magical game takes place in a great wizard’s high tower, that looks like something straight out of a scene of Harry Potter. Alkemor a well animated and wise looking old wizard welcomes his guests into magnificent his home full of spellbooks, gold, and jewels. 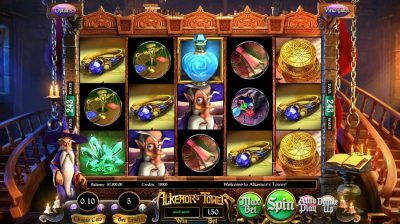 Alkemors royal wizarding robes and long white beard paired with his stylish furniture make for an authentic slot where anything is possible including an abundance of winnings. Alkemors Tower has 5 reels and an astounding 243 paylines, an offers medium volatility. The symbols are headed up by Alkemor himself, together with an array of magical items including a crystal, coins, ring, gems, mushroom, scroll, spellbook and 4 different colored glass “elemental” bottles. 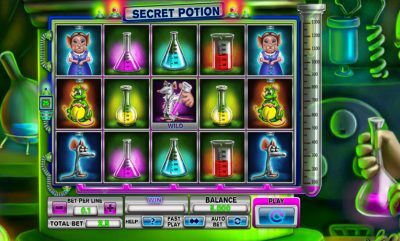 The controls are woven nicely into the wizards mansion with Options and View Pays up top, while down below we find: Choose Coin, Bet Level, Win, Bet, Max Bet, Spin, Autoplay and Double up (i.e., Gamble). Landing 2 regular spell books and one wrapped in a vine, activates Natures Floor free spins. You can win 10, 12 or 15 spins. The Nature Floor is an entirely new set of reels featuring a brand new set of symbols. One great part of this feature is a vine symbol anywhere on reel 3 gobbles up it’s surrounding symbols and rewards are given for each eaten symbol. The Second type of free spins is Celestial Floor Free Spins. Landing a Spellbook wrapped in a sunbow, together with 2 regular Spell books will take you to the Celestial Floor for 10, 12 or 15 Free Spins. This whole new environment with solar system type symbols also has a unique surprise: the black hole symbol anywhere on reels 2 or 4 will consume any surrounding symbols and issue a reward for each one. In regular play after each winning spin, there is a Double Up (i.e., gamble) function in which you can take a double or nothing bet on a simple coin toss. Earth (brown): The ground shakes as Alkemor brings meteors raining onto the reels. All spell book and elemental symbols on reels 2-5 become wild. All other symbols are destroyed, and new symbols fall in their place. Wins are then recalculated. Water (dark blue): A wave is summoned by Alkemor which crashes on the screen. All elemental and spell book symbols on reels 2-5 become wild while the spell book symbol on reel 1 is transformed into a random payable symbol. Wins are recalculated and multiplied by the number of elemental and spell book symbols that activated the feature. Air (light blue): A tornado is summoned by our titular wizard, causing all symbols on reels 2-5 to become wild and all other symbols to fly into brand new positions on the reels. The spellbook symbol on reel 1 changes to a random payable symbol and wins are recalculated. Fire (red): Alkemor shoots a ball of fire at the reels, causing them to catch alight. All spell book and elemental symbols on reels 2-5 burn into special wild symbols, and the spellbook symbol on reel 1 transforms into a random paying symbol. Extra wild symbols, equal to the number of spell books in the triggering spin, are added. Wins are then recalculated. Alkemors Tower was pure magic on all devices tested, with zero performance issues. The theme and soundtrack were well thought out making one spell bounding experience. Another great hit from Betsoft! Players of all ranges will thoroughly enjoy the game as it has something for everyone.